Arduino is one of the most popular open-source electronics platform. But how does it fit with Bluetooth Low energy (BLE) technology? There are two opposite answers. On one hand, there are quite a number of modules and shields that are designed specially for Arduino usage. On the other, the number of producers with name of such modules/shields is quite poor (maybe 4). 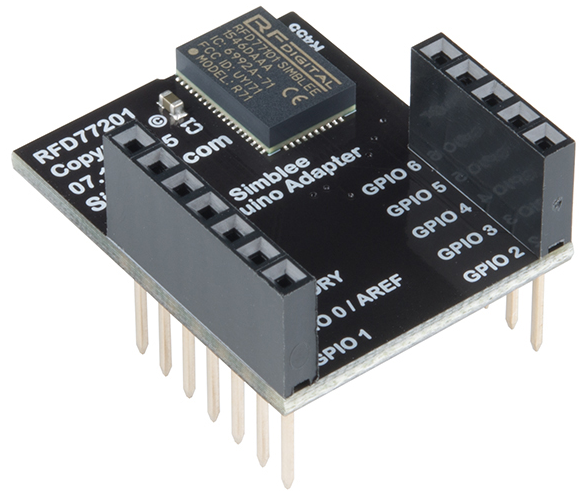 Also, there finding low-cost BLE modules for Arduino is rare. 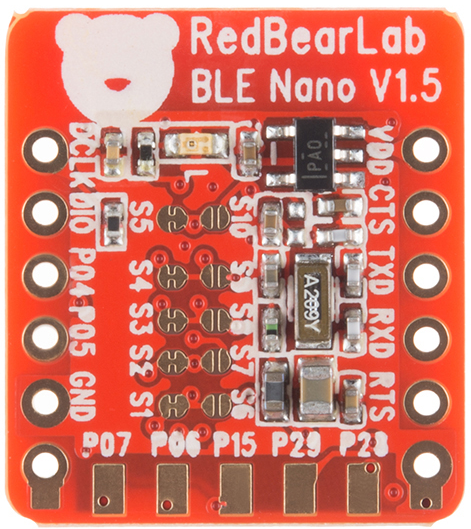 Before we give to a brief review, let’s answer make the distinction between a BLE module and a BLE shield. A module’s interface can be connected with the Arduino using standard jumper cables. It doesn’t sit on the Arduino and gives easy access to other pins. A shield is something that sits on the Arduino directly, without any wires. Shields are specifically designed for the Arduino. This makes it easier to connect them and less error-prone. They are usually good for quick proof-of-concept builds. The most popular module for Arduino is HM-10 and HM-11 (the smaller version). There are several clones of these modules (like JDY-08 or AT-09) on the market. HM-10 can work autonomously without the need of a microcontroller. The module already mounted on a breakout board. HM-11 is the smaller form factor version of HM-10. HM-11’s functionally behave the same but expose less pins from the original CC254x chip. Use TI CC2541 chip, configuration space of 256 KB. Power: Low Power Mode 50 uA ~ 500 uA, Standby mode 6 mA, Active mode 10 mA. 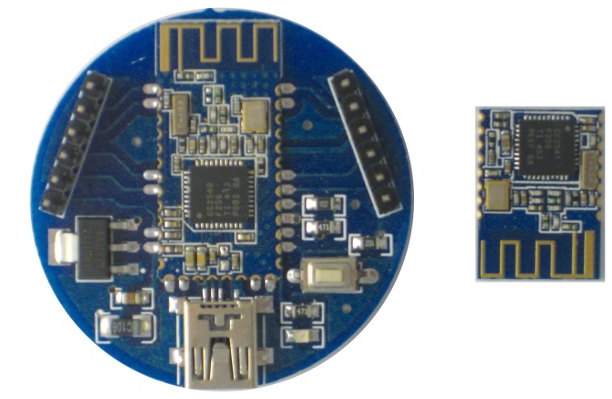 This is a really small (18.5mm x 21.0mm) development board that supports BLE 4.1. The chip is Nordic nRF51822 (ARM Cortex-M0 SoC, BLE capability) with ultra low power consumption. This board is good for IoT applications. Additionally, there is a MK20 USB Board for programming Nano. Three methods could be used for programming the board: Arduino Library for nRF51822, Nordic nRF51822 BLE SDK, Bluetooth Low Energy API developed by mbed. This module is quite attractive for developers due to five major factors. Free iOS open-source SDK. 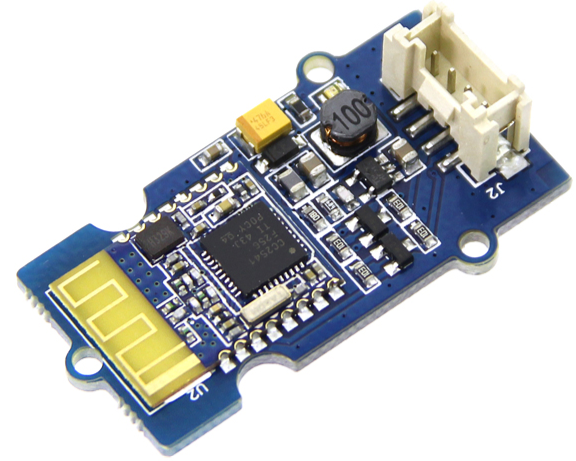 BLE Mini module requires a serial port for communication. Compatible with other BLE Mini or BLE Shield. Ability to develop own firmware. Size: 39×18.5x 3.8mm that allows to use module with Arduino boards Mini/Micro/Nano/Pro Mini etc. 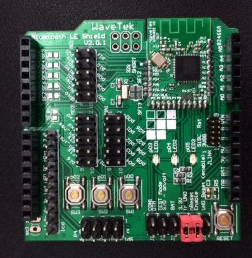 The module gives access to all I/O chip’s pins and the ability to upload firmware via USB. use a mobile device as an internet gateway for the Arduino. Nordic nRF8001 acts as a peripheral only. However, nRF8001 can receive new data at any time or be busy processing a connection event or new data. Traditional CSN signals used to initiate an SPI transaction are replaced by two active low hand-shake signal from RDYN and REQN lines. RFDuino integrates the GUI description code with the Arduino firmware running on the module. The module is equipped with a Bluetooth Smart radio transceiver with ARM Cortex M0 microcontroller that can be programmed using the simple-to-use Arduino IDE with Simblee extensions. The RFduino runs Arduino code and does everything an Arduino can. RFDuino has simple assembly: plug the RFduino into a USB port, use the Arduino IDE, detach the RFduino USB shield and plug the RFduino directly into project board. -55 dBm to +4 dBm TX power. The Bluno Series includes three different products: Romeo BLE, Beetle BLE, and Bluno. 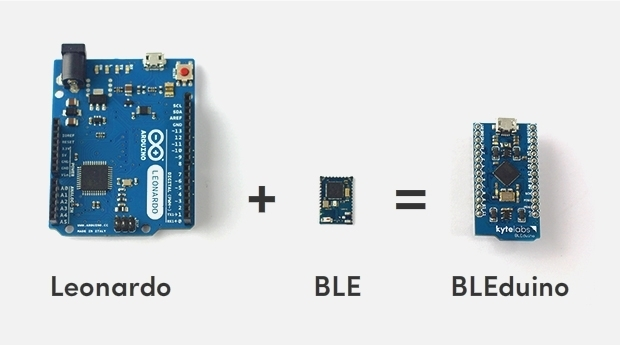 Bluno is first of its kind integrating Bluetooth 4.0 (BLE) module into Arduino Uno. 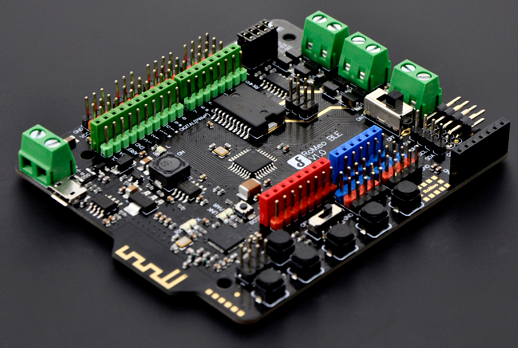 This board integrates a TI CC2540 BT 4.0 chip with the Arduino UNO development board. Beetle BLE is similar to Bluno but has smaller form factor. Beetle BLE is fully compatible with Bluno in instructions and procedures. It supports Bluetooth HID and ibeacon modes. The Beetle BLE offers a tiny and low cost Arduino with Bluetooth 4.0. The Romeo BLE is developed for usage in robots. It gives a robot control board the power of easy set up. Chips integrated with the Bluno Series modules provide wireless programming via BLE, Bluetooth HID, AT command config and firmware upgrading. Additionally, PlayBluno is a free opensouce app for developers. Users are able to control robots/mobile platforms with a GoBle controller. It’s important to note that the Bluno Series does not support BLE devices from other makers since the Bluetooth profile varies. The BLE WT51822-ABS BLE shield for Arduino V2 is an Arduino form factor shield providing Bluetooth Smart connectivity to the STM32 Nucleo/Arduino Uno development boards. Header pins provide access to all GPIO and interfaces. The board is compatible with the S110 Bluetooth Smart Soft Devices and the nRF51 SDK. Programming and debugging are performed using ST-Link on the STM32 Nucleo board. 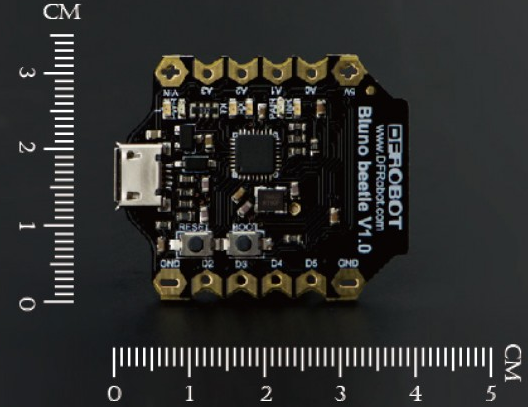 The Genuino keeps the same robust form factor and peripheral list of the UNO with the addition of onboard Bluetooth LE capabilities and the Bosch BMI160 six-axis accelerometer and gyroscope. The Nordic nRF518 Bluetooth chipset feeds into the 32-bit DSP sensor hub that forms part of the Intel Curie system. The Genuino 101 takes this another step forward. Most functions can be added to an Arduino with the judicious use of a Shield or some electronic components. 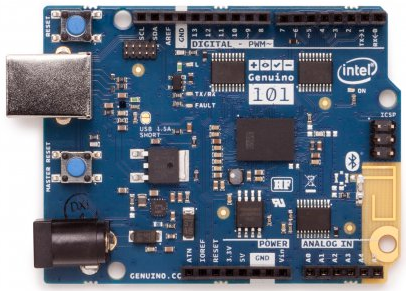 But a couple of the most interesting and useful options come standard with the Genuino 101. Compatible with standard Arduino IDE. Grove – BLE is a part of the Groove boards series developed under Seeeds platform. It is a development board for Arduino that uses a Low Energy Bluetooth module – HM-11. As a Grove product it’s convenient to use the Grove – BLE with an Arduino board via Base Shield. The device can communicate with mobile devices easily without pairing. It can be used for many conditions, like remote control equipment or robot controls. It come with a preprogrammed command set specific to the board. Sleeping Current < 1 mA. 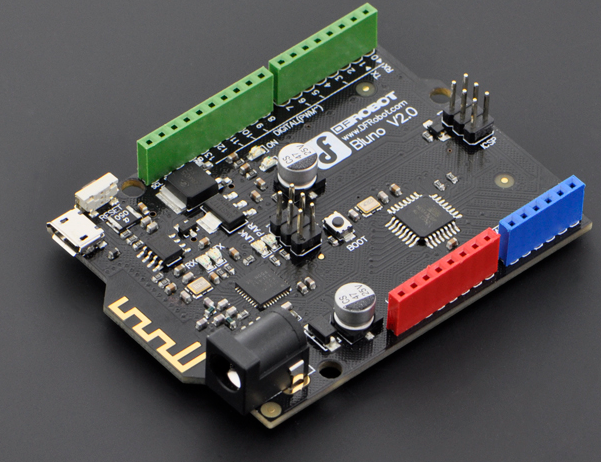 The BLEduino is a development board compatible with the Arduino UNO. It allows wireless programming via BLE, supports Bluetooth HID and supports AT command to config the BLE device. It is developed using the open source app for BLEduino (Android and IOS), that can be modified and used for the development of different BLE-hardware platform. Flash Memory – 32 KB. Expected BLE Range – at least 80 ft (currently testing).